EGO is a business built on innovation. Part of an international manufacturing business established in 1993, we’ve pushed the boundaries of cordless technology from the very first days. Today we’re one of the world’s biggest tool manufacturers, producing over 10 million units each year, selling in 65 countries worldwide. Our unique patented Arc Lithium technology is designed like no other battery. It's why it performs like no other battery. It's not just the innovative Arc design that helps prevent overheating. Each cell is surrounded by our unique Keep Cool™ material that absorbs heat energy and keeps cells at their optimum temperature for longer. The EGO Power+ Arc Lithium 56v battery uses intelligent power management to constantly monitoring and optimising each individual cell, so you always get the very best power, performance and run time. Unlike other manufacturers, to stay cool our batteries fit onto the outside of our tools - not encased on the inside. They’re protected from dust and moisture by a resin coating and a shock and vibration absorbing case. Not only does it deliver the industry's highest energy capacity in a portable handheld battery. It also means when it's time to recharge, the EGO Power+ Arc Lithium 56v battery is the quickest around. 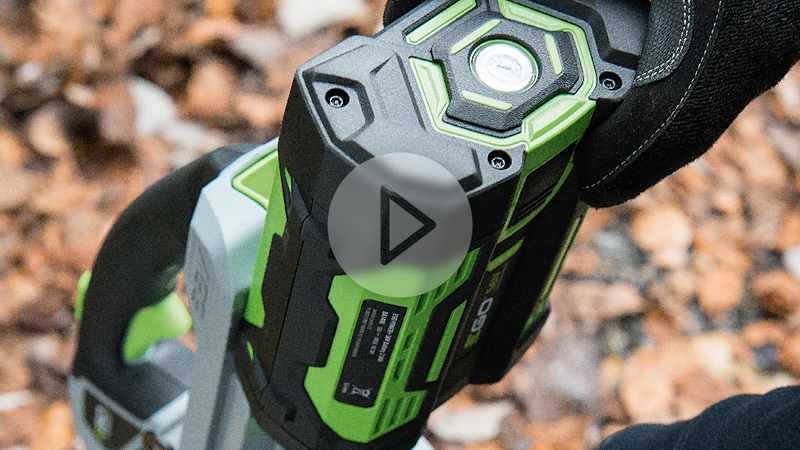 The same Arc Lithium battery fits every tool in the EGO Power+ range. Just click in the battery and you’re ready to go. *Cost of charging according to kW pricing in UK. **Cost of petrol mix based on published UK pricing. †Petrol equivalent of 3 litres per day. Those who regularly use handheld power tools may be at risk of Hand-Arm Vibration (HAV) syndrome. Also known as ‘Vibration White Finger’ it causes painful and disabling disorders of the blood vessels, nerves and joints. However, HAV syndrome is preventable. One way it can be avoided is by choosing tools that vibrate less than traditional petrol-powered products - like the tools in the EGO Power+ range. With a smooth electric motor and less moving parts, the EGO Power+ mower, blower, hedge trimmer, line trimmer, brush cutter, chain saw and multi-tool have been designed to operate with low levels of vibration, often under the 2.5m/s2 Exposure Action Value limit (EAV) and well below the Exposure Limit Value (ELV). The EGO Power+ range is much quieter than petrol-powered alternatives which will reduce the risk of potential damage, especially over long-term use.